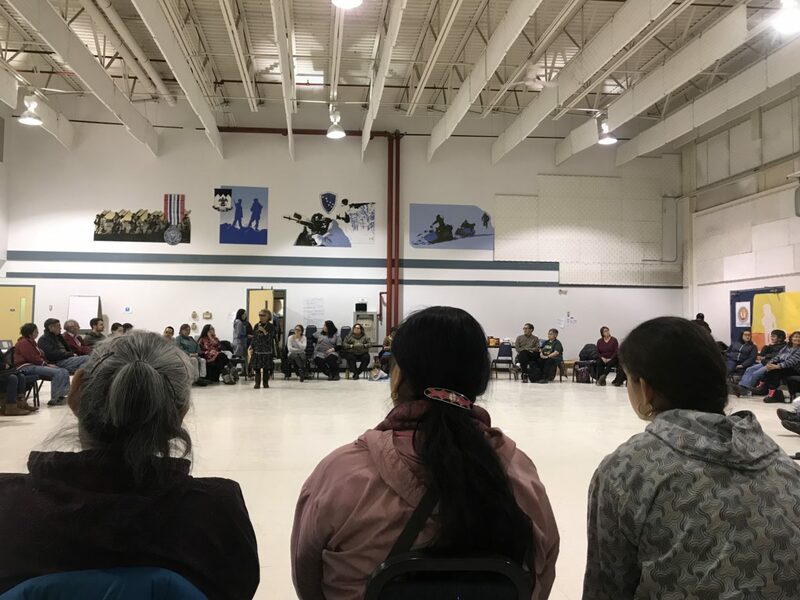 Iñupiaq language revitalization efforts continued at a summit held in Kotzebue last week. 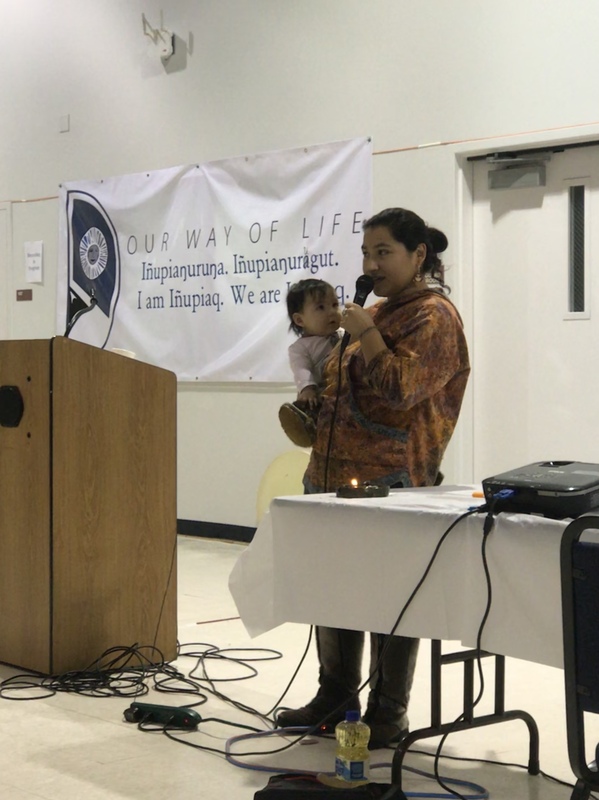 Eagerly kicking off the Iñupiaq language summit in Kotzebue on January 24 were students singing “It’s A Small World,” among other songs, translated to Iñupiaq. The crowd couldn’t help but smile at the youth speaking and singing their native language: something an event like Kipiġniutit Iñupiuraallanikun hopes to promote more of. 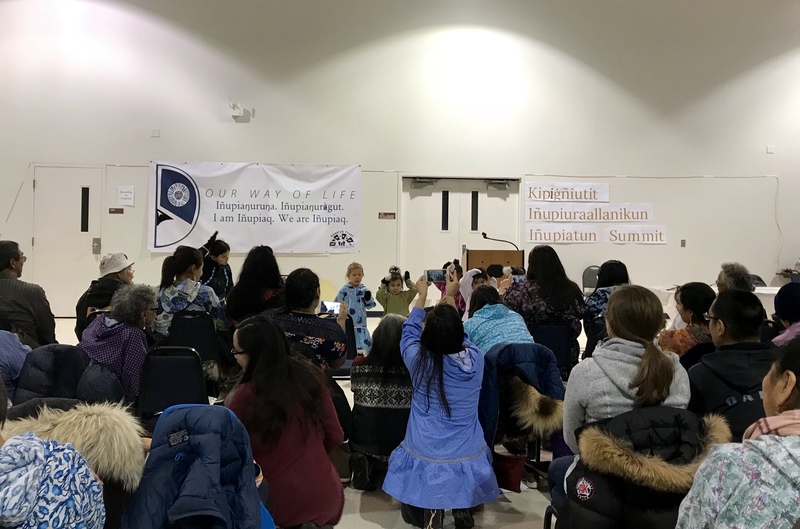 Summit participants watch as children sing songs in Iñupiaq on January 24, 2019. Photo: Katie Kazmierski, KNOM. That’s Qiġñaaq Cordelia Kellie, one of the event’s organizers. She says the idea to hold the summit came about at an event held over the summer by UAF: the Alaska Native Languages Revitalization Institute. It was a chance for Iñupiaq speakers to connect from across the state: primarily the North Slope, Northwest Arctic, and Bering Straits. The resulting event spanned two days, January 24-25, in Kotzebue. At the start of the summit on Thursday, Kunaq Marjorie Tahbone lit a traditional lamp, the Naniq, a reminder of strength which also invites ancestors into the space. Marjorie Tahbone explains the significance of lighting the Naniq at the start of the Iñupiaq Summit in Kotzebue on January 24, 2019. Photo: Katie Kazmierski, KNOM. What followed was a talk from elders Tarruq and Aġnik Schaeffer. Aġnik addressed the crowd entirely in Iñupiaq. Tarruq spoke about the importance of understanding one’s Iñupiaq identity, especially for youth. But it doesn’t stop at knowing who you are; he says it’s about making young people proud of who they are, through knowing and embracing a culture and a language that has been systematically stripped. It doesn’t help, he points out, that the Iñupiaq language is usually “pigeon-holed” as an elective in schools, if even that. He thinks that until Iñupiaq identity is a part of the everyday curriculum, identity and grappling with self-worth will remain issues for Iñupiat. Panigruaq Raymond Ipalook is passionate about teaching his young son Iñupiaq. In the circle we’re sitting in, he passes around illustrated children’s books featuring animals native to Alaska, like moose and foxes. They’re written entirely in Iñupiaq, a project done by UAF for the Bilingual Education Program of the Alaska Rural School Project. Raymond says he tries to read one to his child once every hour. During The Language of Child Raising session, participants look at Iñupiaq-learning books shared by Raymond Ipalook. Photo: Katie Kazmierski, KNOM. Several parents express the difficulty that comes with being a second language learner, but simultaneously, the beauty in being able to learn with their children. One expecting mother describes decorating her nursery with printed-out Iñupiaq words and phrases, reminding herself to practice them now, and soon, with her newborn. Other sessions focused on a range of topics—revitalizing language at the local level, teaching methods and strategies for fluent speakers, and literature translation, to name a few. It was clear that participants from across the three regions were united by a common goal: spreading Iñupiaq language and culture through various means, whether that looks like imploring schools to hire more bilingual staff, using VHF radio for language lessons, or connecting former students to new ones. Cordelia Kellie says in February, the group will hold its first joint commission call to continue planning and organizing initiatives. 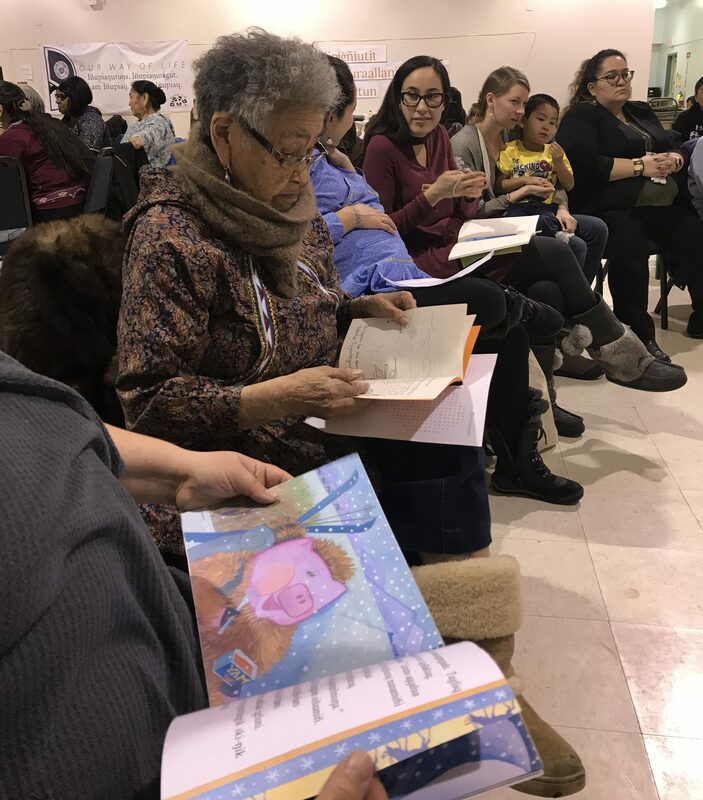 Based on the event’s success in bringing communities across the state together in one place, Cordelia thinks things are looking positive for the future of Iñupiaq language revitalization. Friday closed with a song, “Aarigaa”: sung by children and elders, fluent speakers and learners, together as one. Image at top: Friday at the Inupiaq Summit, Kipiġniutit Iñupiuraallanikun, in Kotzebue. Photo: Davis Hovey, KNOM.